Along with most of the rest of the world, Canada’s economy has been on an upswing. The country has recovered from a recent oil price shock, and a depreciating Canadian dollar has helped exporters. 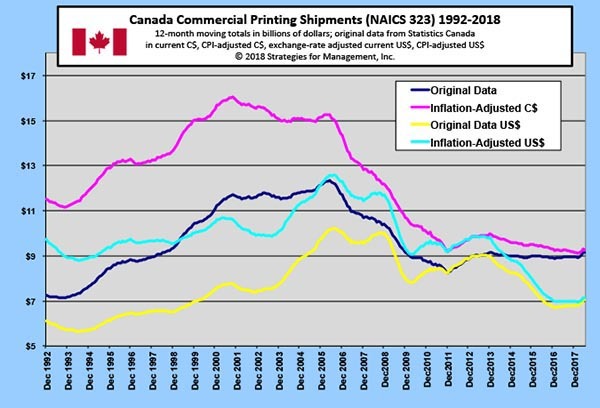 Looking at the 12-month moving average of Canada’s printing shipments, it may look like Canada’s printing industry has been holding steady, but the inflation-adjusted figures show a slight decline from a recent peak at the end of 2013. Shipments fell off a cliff once the Great Recession hit (just like in the Lower 48) and a brief resurgence at the end of 2011 was a bit short-lived. At the same time, the value of the Canadian dollar has been dropping relative to the U.S. dollar; it hit a recent peak of 0.82 of U.S.$ in September 2017 and dropped to 0.75 in June 2018.